Obsessed with new ways to show off lighting cables and electronic wires. No longer is there a need to hide that typical white or black plastic cord! 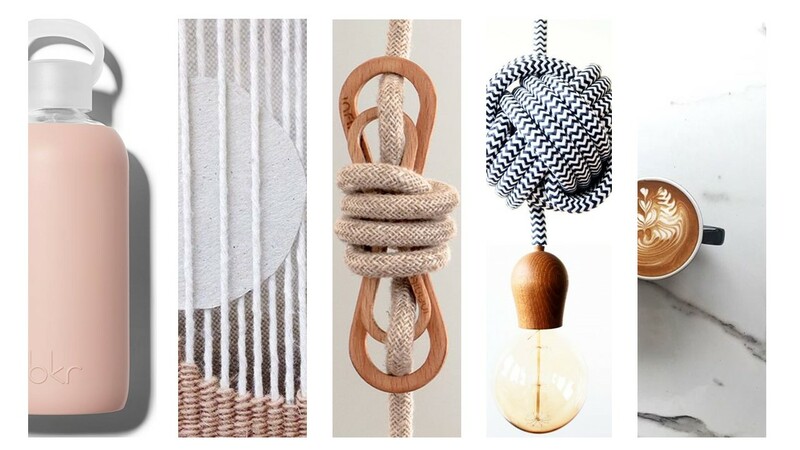 From pops of colour to two toned weaves, cables are trailing behind small appliances, lighting fixtures, and anything more that could use a cord with style. Ikea has made an example of this with their desk lamps and Apple has just released new iPhone chargers with braided cables. Plus, there are thousands of lamps that hang from simple textile cables or even cables like the ones hanging around the Aim Light Pendant by Bouroullec Brothers. Don’t fret if most of your chic lights already came with a boring cord, “cable lovers” is an online store that has everything you need to make your lamps better. Obsessed with how you can get a tan, beer, and a great hanging wall piece all in one afternoon. With an array of never ending diverse stores, main street should always be your go to zone for anything that includes the words, “local, craft, or hip food. A day on main could include a stop at La Marche St. George for crepes, followed by a browse through stores like Nineteen Ten, and Vancouver Special. Eventually making a stop at Anh and Chi for pho, then moving onwards to some antique furniture stores. Finally ending the afternoon off at Brassneck Brewery or Cartem’s Donuterie for a treat. Sounds like fun right? Obsessed with how hydrating is not only healthy, but with the right bottle, stylish as well. Invest in a well designed water bottle and you’ll want to show it off everywhere you go! Hitting that recommended daily intake of 2L will be as easy as 1-2-3 with a Soma water bottle. They don’t ship to Canada…yet…but if you have a PO Box, send your goods there and go for a drive, it’ll be well worth it. The bamboo wooden lid and silicon wrap base of their shatter resistant glass bottles makes for an Instagram worthy pic. For something more conveniently closer to home, try a bkr bottle. These beauties are made up of a small mouthed glass bottle, and a silicon sleeve that comes in a never ending variety of fashionable colours. Cheers! Let us know some of your current obsessions #area3obsessions. Studying design in school we have learned about many styles and notable designers. Surely all of them have influenced design and the way it has evolved over the past century and into what we know now. Out of all of the names we became familiar with there are always a handful that holds a special place in our heart. From iconic buildings that exemplify International Style to the chair we now see in every design magazine, these design icons have made their mark. We have mentioned him and his iconic Barcelona Pavilion before in one of our blog posts, “Top 10 Design Quotes,” but Mies’ philosophy of “less is more” is still being widely embraced today. If there is one thing we admire most about his work is his attention to detail and his careful selection of materials – exemplified in the Barcelona Pavilion. Is it fair to say that he paved the way to our appreciation for simplicity and minimalism today? We think so. Does the name sound familiar? It should! You have probably seen their namesake chairs everywhere and probably wanted one or own one. This dynamic duo did not just design iconic furniture pieces but architecture as well – such as Case Study House 8. They are best known for their groundbreaking contributions to American architecture, furniture design, industrial design and manufacturing in the 20th century. With work that includes architecture, furniture, textiles and glassware, Alvar Aalto is a well-known name. Hailed as one of Finland’s greatest architects, Aalto helped define the style and aesthetic reputation of the Scandinavian nation. Expressionist in style, his work was like art. In his entire career he designed over 500 buildings with approximately 300 built. Although most of his buildings are in Finland, some can also be found in France, Germany, Italy and in the U.S. Founder of Knoll furniture, Florence Knoll is a talented architect and designer that studied under other great names such as Eero Saarinen and Mies Van der Rohe. She revolutionized interior space planning and is famous for her philosophy of “total design.” She approached design by embracing everything about a space – architecture, interior design, graphics, textiles and manufacturing. She set the standard in the mid 20th century and is now the standard today.